Last week, I had the opportunity to attend one of my favorite travel and tourism trade shows: Travel South Showcase, held this year in Charleston, West Virginia. In fact, I realized that I have attended the show on and off for a solid decade now, since my husband accompanied me for the first time to Travel South in Mobile, Alabama in February 2004 when our new ten year old daughter was barely ten weeks old. I have plenty of food stories from that show to share here sometime as well, but I digress. This particular event is a gathering of group travel planners (companies and individuals who plan trips for students, organizations and senior groups) meeting speed-dating style with tourism attractions, destination marketing organizations, hoteliers, resorts and tourism commissions. Travel professionals chat for seven minutes, just long enough to decide on whether they ought to see one another more seriously. One of my favorite features this year was the sheer number of journalists participating, including many of my favorite (and new favorite) magazines highlighting travel in the south: Garden & Gun, Budget Travel, The Local Palate and even The Toronoto Star were a few of the stellar publications represented. 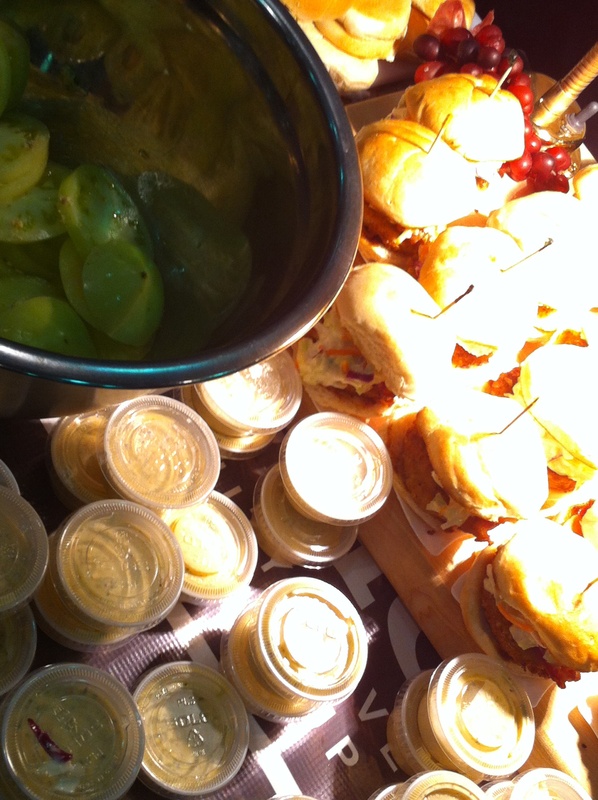 However, all of this took a serious backseat to the single most riveting discovery I encountered at Travel South: Fried Green Tomato Sliders prepared by a local high school (Tucker County) culinary program representing West Virginia’s ProStart investment in the hospitality industry. Just wowza. I’ve been pretty smitten with fried green tomatoes since the eponymous 1991 movie (and book) at the Whistle Stop Cafe by Fannie Flagg. My quick photo won’t do it justice, but trust me: these need to be on your radar. Get it. If you whip up a batch or render your own interpretation, let me know how it goes! Y’all can have your bacon. I think everything is better with remoulade.